A dated photo of the 63 boxwood hedge to be removed. It extends around the corner. In ancient times, bonsai artists scoured mountainsides and other such areas for trees with character for bonsai. Nowadays, living in cities and having a desire to preserve such assets as they exist in nature, this material is very limited. However, older homes will frequently have woody plantings that, at some point, homeowners decide to remove. After many years of growth and pruning, such material frequently obtains a certain gravitas and can often make fantastic bonsai material. 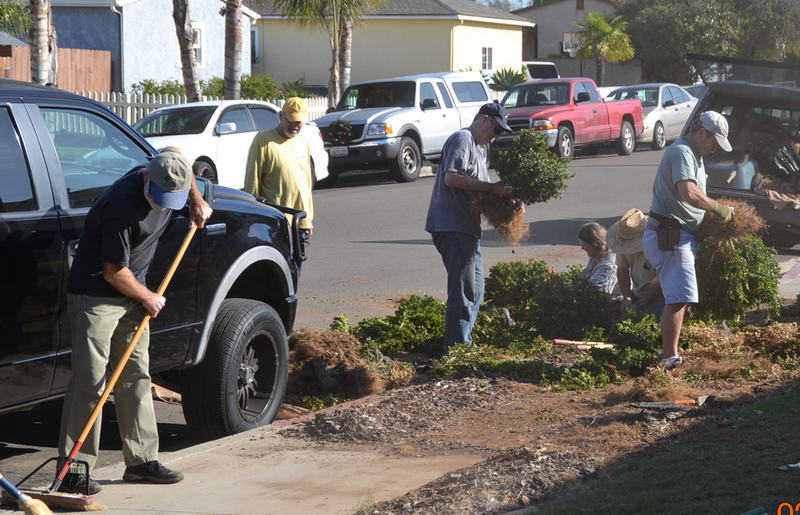 San Diego Bonsai Club was contacted regarding a homeowner in San Diego who wanted a hedge removed and would like to see the plants go to a good use. The hedge was comprised of 63 boxwoods that had been planted at least 10 years ago, likely longer. Charlie Mosse, SDBC First Vice President, coordinated the timing of the effort with the homeowner and club members. At 9AM on January 3rd, approximately 20 SDBC club members reported to the property and the carefully remove the boxwoods. The club members then shoveled the soil back into the holes, returned the mulch covering, and cleaned the adjacent sidewalks. The boxwoods will go to good use. Many will now begin bonsai training in club member's private collections and the remainder will be used in the club's educational program. If you know of someone who needs a hedge or other woody plantings removed that may possibly be made into good bonsai, contact SDBC about free removal and save them from the landfill.